When you’re in the market for antique or vintage items, you know that there are all kinds of ways unscrupulous dealers can misrepresent the items they have for sale. Both the age and condition of antique items influence their value heavily, but neither is always easy to fully determine through a visual inspection alone. 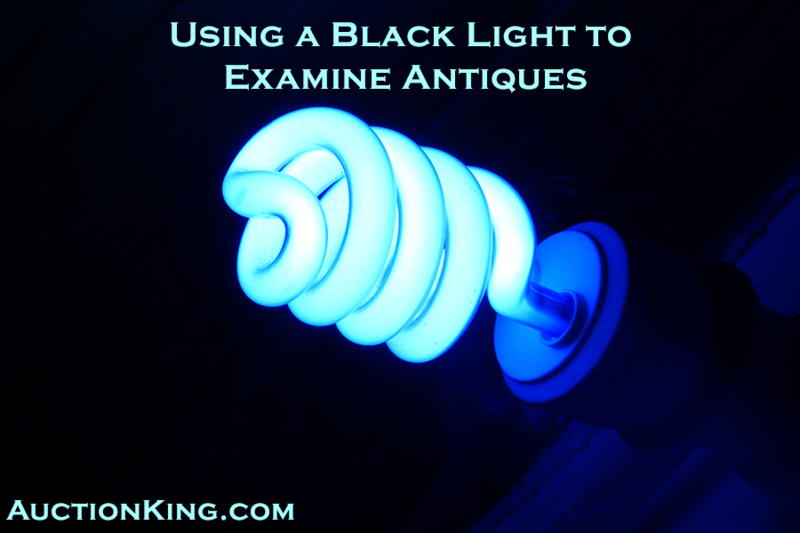 Examining an item under black light is a simple step that can reveal useful information about an item you’re considering purchasing. Porcelain: Expert repairs on a piece of fine porcelain may not be visible, but the modern glue used will fluoresce under a black light, making the extent and location of the fix apparent. Modern paints used to touch up faded designs or details will fluoresce as well. Black light can also help distinguish between hard paste and soft paste porcelain pieces, because the former will glow deep blue or purple, while the latter will glow white. Glassware: Certain types of glassware will glow under a black light, which can help establish the authenticity of a piece. For example, both green Depression glass and Vaseline glass contain uranium oxide, which will cause them to fluoresce. It’s best to do your homework in advance to determine whether the type of piece you’re considering is expected to have an established fluorescent effect under black light, as the lack of one in that case can quickly reveal a reproduction being marketed as the real thing. Cast iron: In the 1900s, many interesting pieces were made of painted cast iron, including mechanical toys, banks, and door stops. These can be quite valuable when found in good condition with their original paint. However, there are many reproductions of these types of pieces on the market as well, and it isn’t always easy to tell the difference. Modern paint and glue will show up under a black light, revealing touch-ups, repairs, and outright fakes. Ephemera on paper: Paper products—think baseball cards, posters, postcards, photos, etc.—from before the 1930s rarely glow under black light. In the 1940s, however, paper manufacturers started widely using chemicals called “optical brighteners” to make their paper look whiter, which means that modern paper generally glows under UV light. This can help distinguish an original from a reproduction. Of course, using a black light will not give you all the information you need to know about an antique. Such examinations should be used in conjunction with other information and expert advice before you make a decision to buy. You should also take care to work only with reliable dealers who stand behind the authenticity of the antiques and collectibles they put up for sale. 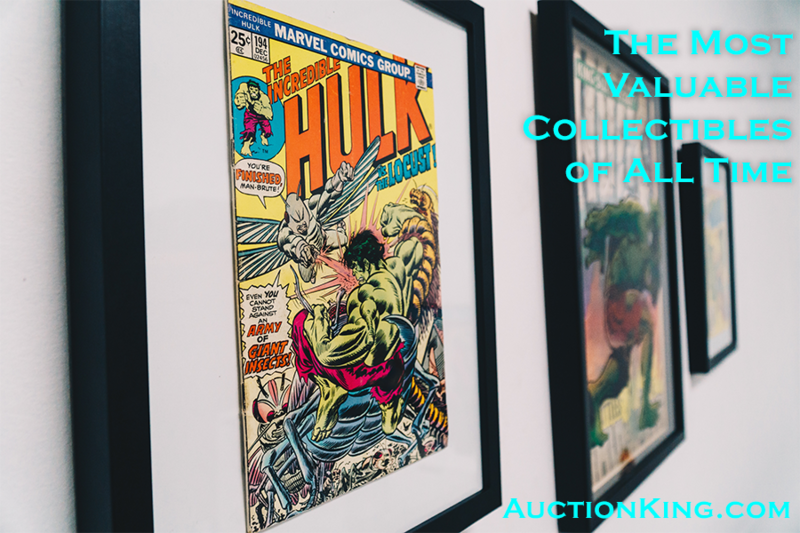 Auction King offers a wide variety of collectibles and vintage items in different categories for the particular collector. We triple-check the authenticity of every item on our site so that our clients can bid with confidence. Register today for a free online account to find your next treasure. Milk glass is a type of opaque glass that first originated in Venice in the 16th century. Despite the name, not all milk glass is white—even very old pieces can be found in alternative colors such as pink, blue, or brown. Although the genesis of this type of glass is quite old, the milk glass that is found in the collectible market today tends to date from the 19th and 20th centuries, and much of it was produced in America. White milk glass became popular during the Victorian era because it was a beautiful and economical alternative to porcelain, which it resembles. (This is also the era when the term “milk glass” was coined to describe this type of glassware.) A wide variety of decorative pieces were made out of this type of glass, including glasses, dishes, vases, perfume bottles, and decorative boxes. 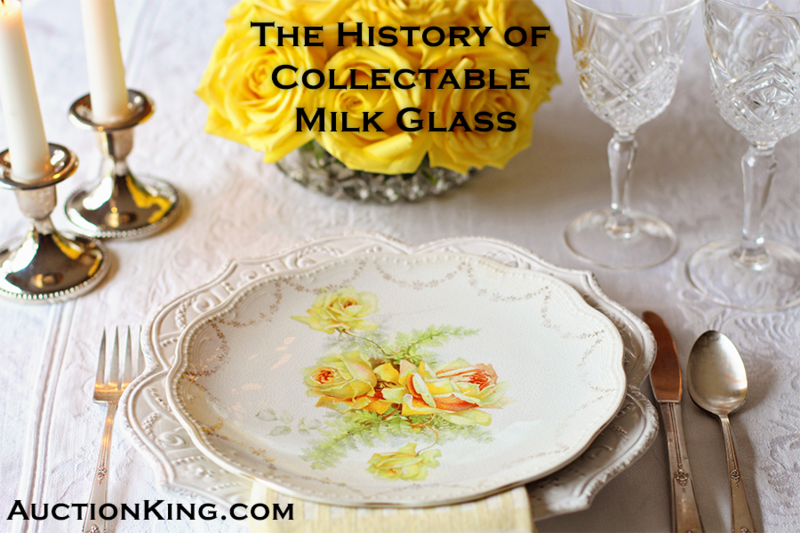 During the Great Depression and into the 1940s, milk glass went out of vogue somewhat, only to enjoy a revival in both popularity and production in the 1950s and 1960s. Because milk glass has enjoyed such a long history, the value of pieces can vary considerably depending on their origin and condition. Milk glass that dates from the 19th century is more valuable than that of more recent manufacture, and pieces that feature unusual patterns will fetch a higher price than more common ones. Some milk glass pieces were designed to commemorate historic events or highlight patriotic themes, such as dishes featuring the likeness of George Washington or memorial pieces for Presidents Lincoln and Garfield. These types can be quite valuable, depending on their rarity. Different patterns of milk glass have become associated with particular manufacturers, such as Fenton’s Hobnail pattern, which it introduced in 1939 and soared to popularity in the 1950s. However, many iconic designs were copied and made by multiple manufacturers, such as covered dishes designed to look like nesting hens. Written guides and identification websites can help interested collectors learn about the variations in design and production during milk glass’s heyday. The long history of milk glass can make it tricky to definitively identify an individual piece as being authentic. This has been complicated by the fact that as some glass manufacturers have gone out of business and their molds were sold off to other companies, some of which continued to produce new pieces with them. Some experts suggest looking through a piece of milk glass in sunlight to detect the iridescent color around the edges known as the “ring of fire,” which is supposed to distinguish older pieces from more recent ones. Makers’ marks on the glass can also help you pin down the date when a particular piece was made. However, if establishing an exact positive ID and value on a piece is important to you, you should take it to an appraiser for an expert examination. Auction King seeks out unusual and attractive collectibles to bring to our clients at below-market prices on our convenient online platform. We verify the authenticity of our pieces so that you can rest assured that what you see is what you’ll get. We constantly update our selection with new finds from our extensive network of sources. Register for a free online account today to start bidding.